Mumbai: For years, Rima Chari’s life involved hospital trips, the consequence of eight childbirths and frequent visits to treat the injuries caused by her husband’s beatings. The last time Chari (name changed), 35, came to Mumbai’s municipal-run K B Bhaba Hospital was because three fingers on her right hand were injured, and she could not work. “I fell,” was her default response when doctors asked her how she injured herself. But the doctors trained to see signs of domestic violence--injuries, fractures, poison consumption, multiple abortions and pregnancies etc--kept prodding gently till she revealed that her husband hit her with a brick. Chari and her husband were migrants to India’s financial capital from Uttar Pradesh and did rag picking to sustain themselves, but her husband was ever suspicious and controlling. He did not allow her to work, talk to others and even forbade contraceptives. Nationally, almost one in three (33.3%) married women aged 15-49 years experienced spousal violence (physical/emotional or sexual) and 3.9% faced violence during pregnancy, according to the National Family Health Survey (2015-16) or NFHS-4. Of all women in India who have ever experienced any type of physical or sexual violence, only 14% have sought help to stop the violence; 77% have neither sought help nor told anyone about the violence they experienced, the survey further revealed. Hospitals are often the first place that women facing violence come to, but once there they rarely get the care that they need. Doctors do not recognise or willfully ignore signs of violence the women face, said experts, and treat them medically without offering social or psychological support. Funded by National Health Mission funds’, Dilaasa centres offer to change that through a model of care that can be replicated across government health centres nationwide. 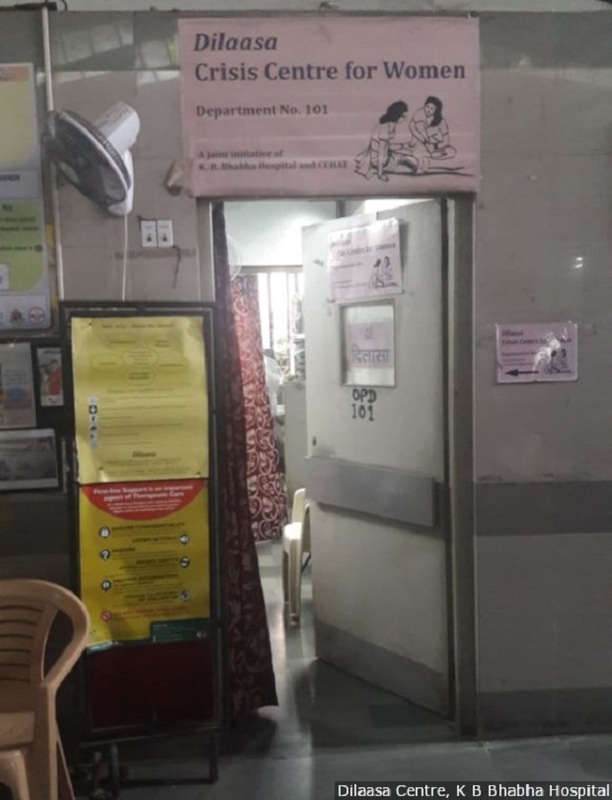 Started in 2001 at the K B Bhabha Hospital, a 423-bed municipal hospital in Bandra, a western Mumbai suburb, by health advocacy Centre for Enquiry into Health and Allied Themes (CEHAT), the Dilaasa centres have reached out to over 8,000 women. The Dilaasa centre at KB Bhabha hospital. Hospitals are often the first place that women facing violence come to, but once there they rarely get the care that they need. Dilaasa centres are changing that. Over the two years to 2018, 5,647 women were identified as potential victims of domestic violence, of which 2,554 cases were registered for domestic violence and 809 cases for sexual violence in the 11 centres in Mumbai, according to municipal records. The model’s effectiveness has convinced more states, including Sikkim, Karnataka, Tamil Nadu, Delhi, Assam and Uttar Pradesh, to replicate it and activate a comprehensive healthcare response to violence, said Sangeeta Rege, coordinator at CEHAT. Apart from Mumbai, the model has been replicated in Kerala, Haryana, Madhya Pradesh, Gujarat, Maharashtra and Meghalaya under different names over four years to 2018. Chari would have not spoken about domestic violence, but when the doctors and physiotherapist at the hospital asked her to visit its Dilassa crisis centre, she decided to drop by. Despite the language barrier--Chari speaks only Bhojpuri despite 10 years in Mumbai--she revealed her husband’s assaults. “It is not your fault,” was one of the first things the counsellors told her and discussed a safety plan with her, strategies she could use to prevent violence, including calling the neighbours, banging the doors when the husband is violent and to negotiate with him to not hit her when he is calm. Chari returned to the hospital over three months and gained enough confidence to ask for a joint-meeting with her husband in presence of counsellors. One of the first conditions she placed before her husband was that he should stop hitting her. It was non-negotiable, she insisted. Fortunately for her, her husband listened and changed his behaviour. The violence also stopped. Chari often visited Dilaasa centres and appraised the counsellors about her life and said he had never hit her again. Everything about the ward and its name–Dilaasa means reassurance–is designed to be accessible for the women who need it. Positioned in the outpatient department, near the gynaecology section where young women seek antenatal care for themselves and their children, the location gives the women the anonymity to seek support. It is also a good place to refer and identify women who face domestic violence but may not come forward themselves. The hospital staff are trained to identify potential red flags as we mentioned earlier: Women who have consumed poison, who have fractures, repeated signs of abortion, pregnancies, sexually transmitted diseases, pelvic inflammatory diseases, anxiety, sleeplessness and depression. The idea is to reach out to young women in the reproductive age group and intervene at an early stage of violence, including the collection of medical evidence when such cases of sexual violence come to the hospital. As we mentioned earlier, almost a third of married women in India have faced spousal violence at least once in their lifetime. Women who have faced violence have a higher chance of seeking healthcare than women who did not, shows evidence. “Hospitals are the right place to reach out to women facing violence because of their large catchment area and they can intervene at an early stage of violence,” said CEHAT’s Rege. “The health-care system can provide women with a safe environment where they can confidentially disclose experiences of violence and receive a supportive response. Furthermore, women subjected to intimate partner violence identify health-care providers as the professionals that they trust with disclosure of abuse,” said a 2014 paper published in the Lancet, a medical journal. Despite the fact that violence against women was identified as a health priority in 2013 guidelines published by the World Health Organization, it is not adequately understood or accepted in national health programmes. In 2016, the Municipal Corporation of Greater Mumbai (MCGM), the civic body governing Mumbai, established 11 Dilaasa centres in municipal hospitals across the city under the National Urban Health Mission (NUHM), the urban arm of National Health Mission. Each centre has two counsellors with a social work degree, two auxiliary nurses/midwives (ANMs) or health workers and a data-entry operator. The centre staff is trained by CEHAT for a week and they in turn train a core group of hospital staff, such as doctors, nurses and administration. “MCGM has taken the lead in establishing 11 Dilaasa hospital-based crisis centres in 2016 and an additional three in teaching hospitals, so we can truly say that we have institutionalised a healthcare response to violence against women and children," said Mangala Gomare, deputy executive health officer, family welfare and child health department. Since it is a non-profit that works at improving health research and accountability, CEHAT wanted to establish a model for hospital-based crisis centres that could be replicated by government, be a part of the formal public health system and be sustainable. While some women come to the centre after reading posters and publicity material in the hospital, others visit because they remembered a nurse telling them about Dilaasa when they were admitted. Others come through referrals from doctors and nurses who deal with sexual- violence cases, after the police bring survivors to the hospital for medical examination. Every pregnant woman who visits the hospital for antenatal care is also referred to the centre in between other medical tests. Counsellors who screened these women found a high prevalence of violence and in 2015-17 ran a study. “We found that of all women who seek antenatal care, in the government hospitals we work in, 17% have faced violence during pregnancy,” said Rege. This is about one in every six pregnant woman. Once the violence victim is at the centre, a counsellor seeks to gain her trust. It takes time but gradually women start opening up about the abuse they face at home. 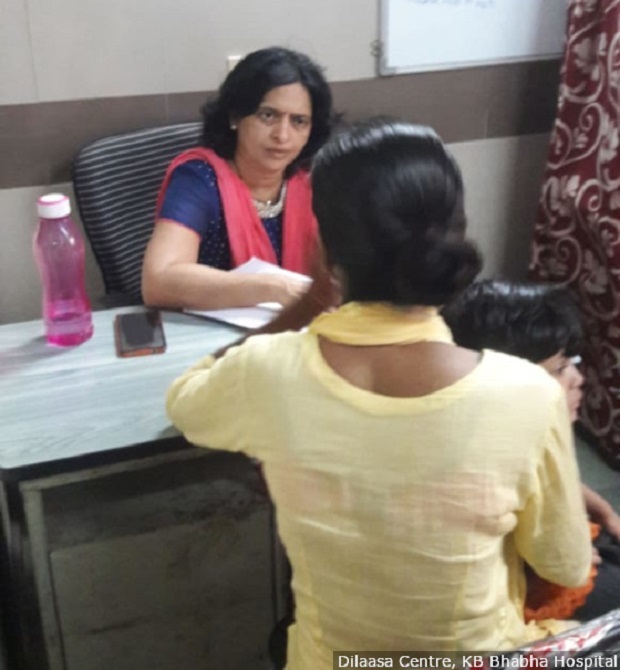 Counsellors like Archana Mali, 34, from V N Desai hospital, a municipal hospital at Santacruz, another western Mumbai suburb, know the women are not always looking for solutions--sometimes they only want to be heard. Dilaasa centre follows the concept of feminist counselling--they discuss the socio-cultural and gender context of the problem the woman faces--and the counsellors primarily aim at empowering woman to protect themselves. They explain to women that violence is not their fault but flows from cultural norms and power dynamics between them and their families. Some strategies followed by women to reduce severity of violence are: Making noise, banging doors, getting the attention of neighbours, so that immediate violence is stopped. In other cases, counsellors help women with injuries who come to the hospital register a medico-legal case--where the doctor examines and writes his observations in a legal document--that can be used as evidence for legal proceedings. What is an abused woman looking for? After a session that lasts about 45 minutes, counsellors find out what is it that an abused woman is looking for: Ways to separate from her spouse, prevent violence or emotional support. A counsellor listens to a woman at the Dilaasa centre. After a session that lasts about 45 minutes, counsellors find out what is it that an abused woman is looking for: Ways to separate from her spouse, prevent violence or emotional support. Many women do not want to separate from their spouses because they do not have the financial resources to live on their own or have no support from their families. For the ones who do want to take that step, counsellors provide a realistic picture of the difficulties ahead, so they are prepared. Counsellors also closely work with police officers and protection officers who conduct inquiries and provide legal assistance for survivors. In some cases, when women fear for their lives and do not want to return to their families, the Dilaasa centres provide shelter for upto 48 hours, so that they can decide what to do next. In other cases, they refer women to other non-government organisations that provide vocational training. Chitra Joshi has been working in the Dilaasa centre at Bhabha Hospital since it began 17 years ago. When the centre was being started, Joshi, a community development officer and now the centre in-charge, realised that most doctors and staff considered domestic violence a family matter. “It was difficult to make them understand the importance of dealing with and intervening in domestic violence cases because at that time in 2000 there was no law around it,” said Joshi. Even though domestic violence was a criminal offense under Section 498A of Indian Penal Code, the Protection from Domestic Abuse Act 2005, which recognised all domestic abuse, even among unmarried women, and the Criminal Law Amendment 2013 related to sexual violence, had not been passed. Joshi and other staff from CEHAT trained hospital staff--medical, paramedical and other support staff--to consider violence through a gender lens and convinced them that violence affects a woman’s health--physically, emotionally or sexually--and intervening is essential, a “best practice” in counselling jargon. Even today, in each hospital with a Dilaasa centre, counsellors train new resident doctors every six months in identifying and mitigating violence against women and children. For women like Chari, the Dilaasa centres offer a chance to speak up about violence, find ways to stop it--and, possibly, a shot at a new life.